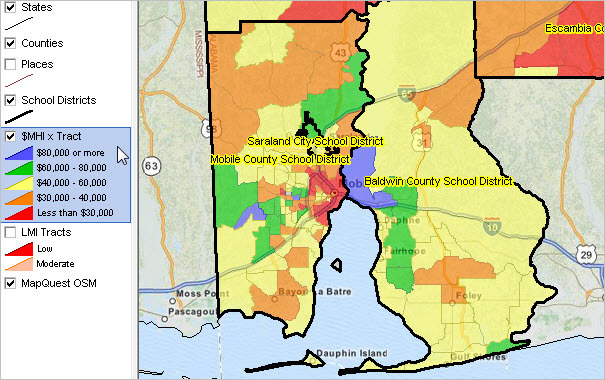 ... rank all school districts on annual demographic size by school district. ... any year for the period 2010-2017 or change. 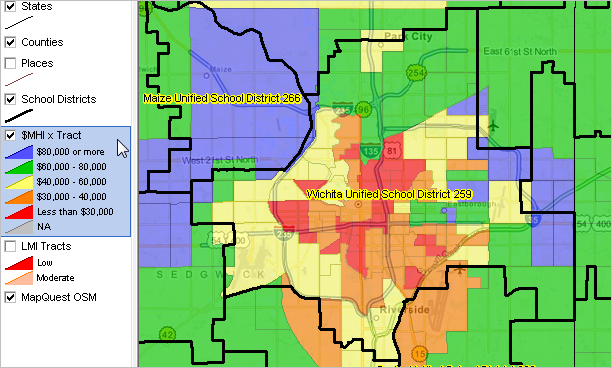 ... use interactive table to query/rank/compare school districts. 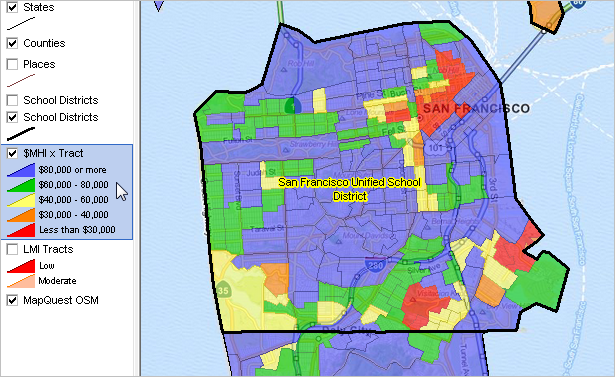 ... query by ZIP code, view/analyze districts in one state, county or CBSA/metro. 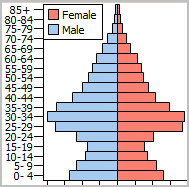 .. click link to use this table: General Demographics. .. click header cell D085 twice .. to sort table in descending order. .. read usage notes below table for additional information. A new set of similar table will be available in December based on ACS 2017 data for all school districts. ... click link in scroll section below to view report. 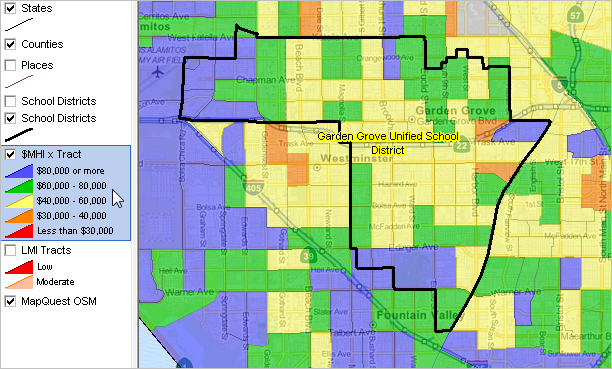 ... Get demographic-economic profile for school districts of interest. ... Key in school district name and state below then click "order profile" button. -- repeat this step for multiple school districts. ... See profile example; profiles in Excel & HTML structure; delivered by email. ... join us in a Web session where we review these data and analyses. 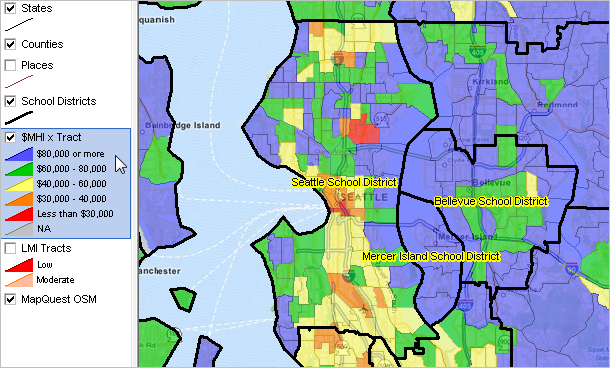 ... 2013 estimates of children in poverty by school district; all U.S. interactive table & GIS resources. ... individual school characteristics; all U.S.; interactive table & GIS resources.  Diversity to 2060 in largest school districts ... how diversity is changing? 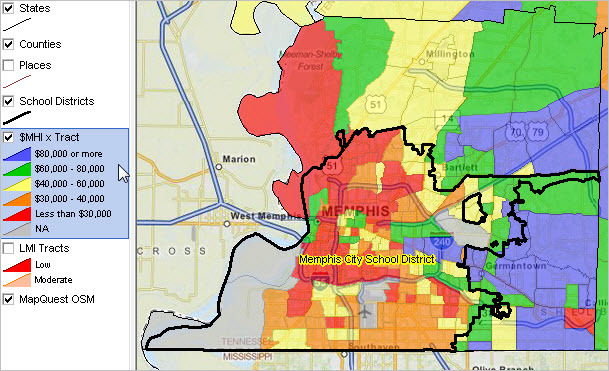 ... How will changing diversity during the next 50 years affect the largest school districts? ... Many of the largest school districts comprise one or several counties. ... See about USA TODAY analyses of county diversity to 2060 using ProximityOne projections. ... See a diversity profile for counties of interest. August 2014 Update. 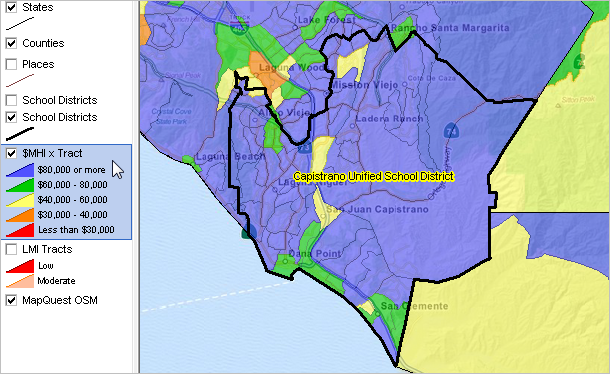 The master set of U.S. school district boundary files (shapefiles) is updated every two years. 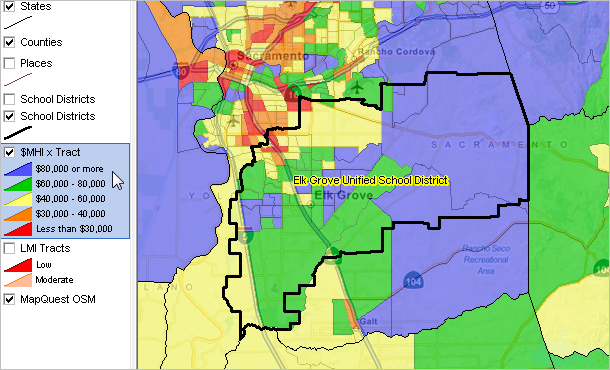 The 2013-14 update is now available and includes 13,479 school districts. These shapefiles provide the geography to develop thematic pattern and reference maps and perform geospatial analysis using GIS software. 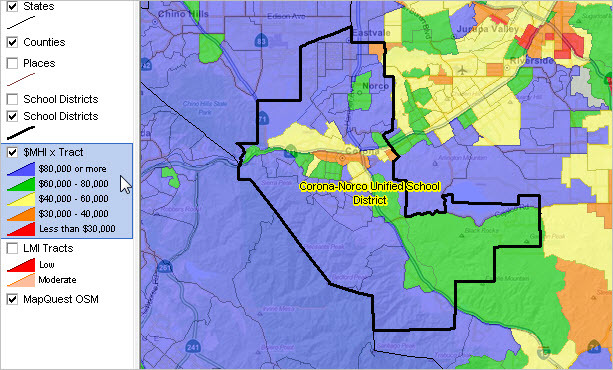 The average 2013-14 school district geographic size (land area) is 275 square miles. The geographically smallest school district is Kashia Elementary School District in California and is 0.067 square miles in size. 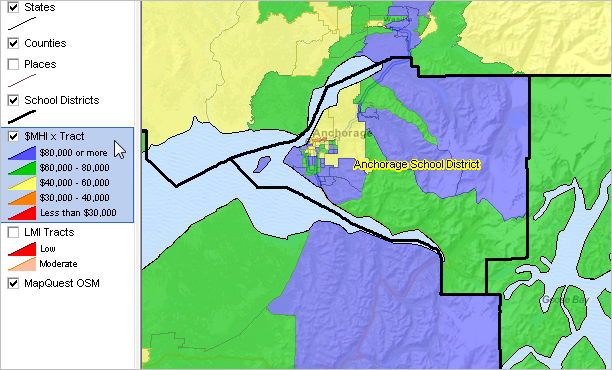 Nineteen of the 25 geographically largest 2013-14 school districts are located in Alaska. The largest district, at almost 89,000 square miles in land area alone, exceeds the size of the State of Minnesota. 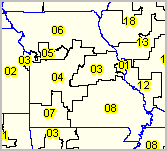 The largest 25 districts are listed below. July 2014 Update. 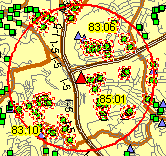 New section on school district urban, suburban, rural classification & pattern analysis ... review tools and methods to examine school districts classified as urban, suburban or rural. Each/all school districts are categorized using a locale code that gives insights into the urban, suburban or rural character of individual districts. 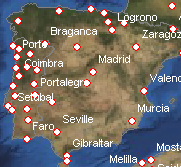 Map views have been developed using a GIS project that may be downloaded and used for extended analysis. See http://proximityone.com/schooldistrictlocale.htm. June 2014 Update. 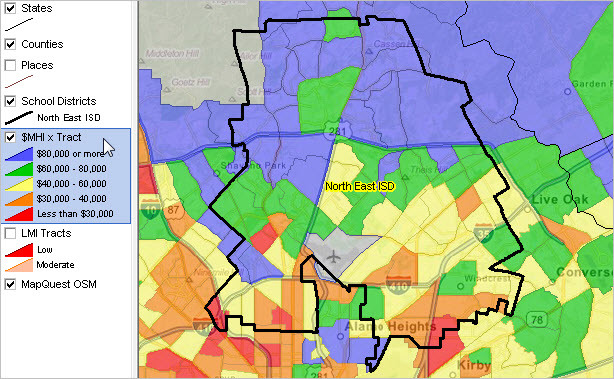 We have developed a national scope school district interactive table and district-level profiles that provide very detailsd data on children's demographic-economic characteristics. These data uniquely provide insights relating to children's demographic-economic characteristics by type of enrollment universe (total children, school age children, school age children enrolled in public schools, school age children enrolled in private school and school age children not enrolled). See http://proximityone.com/sdst0812.htm. April 2014 Update. The list of the largest 100 school districts now includes 2013-14 school year data. 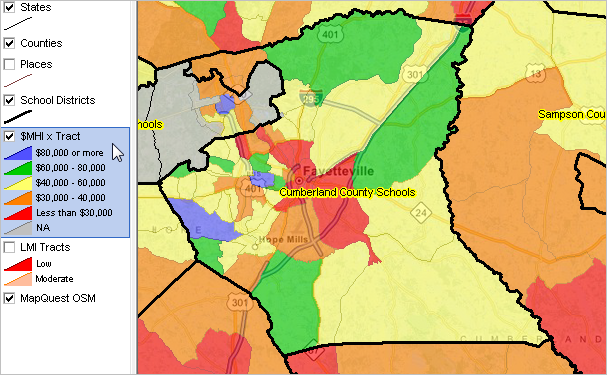 This section includes an interactive table to view characteristics of each/all of these districts and a district-specific section with district map graphics and related data. 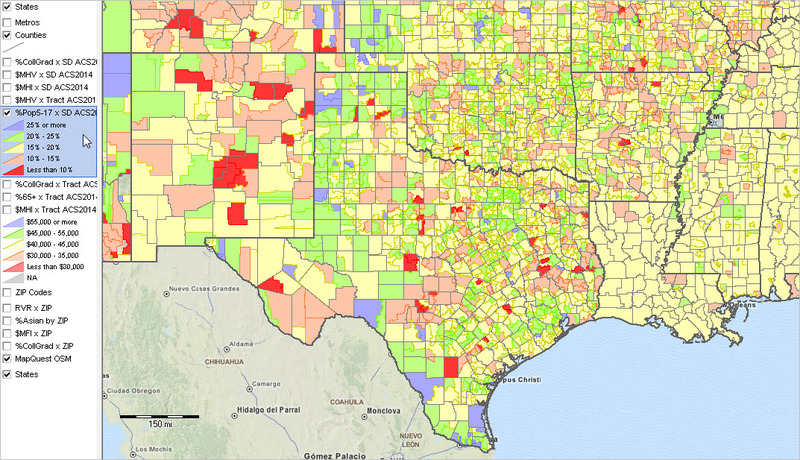 Extended data for each district provide related demographic-economic estimates and projections to help stakeholders gain insights into the how, where, when and by how much change will occur and assess potential impacts. New to the largest 100 list are Klein ISD, TX (Houston area) and Round Rock ISD, TX (Austin area). Use the interactive table below to view/rank/compare the 100 largest districts based on 2013-14 enrollment. Select by state or metropolitan area of interest using the filters below the table. Click a link in a school district row to immediately navigate to a map graphic and related links/attributes for that district, illustrated in the Atlanta section.  Click school district code link to navigate to that section.  Dbl-click column header cell to sort; click again to sort in other direction.  CBSA codes -- http:/proximityone.com/metros2013.htm. .. ACS 2012 5-year median household income for district overall: $48,497. View developed using CV XE GIS and New Mexico DMI GIS Project. See related Albuquerque community profile. See related Bernalillo county projections to 2020. View developed using CV XE GIS and Texas DMI GIS Project. 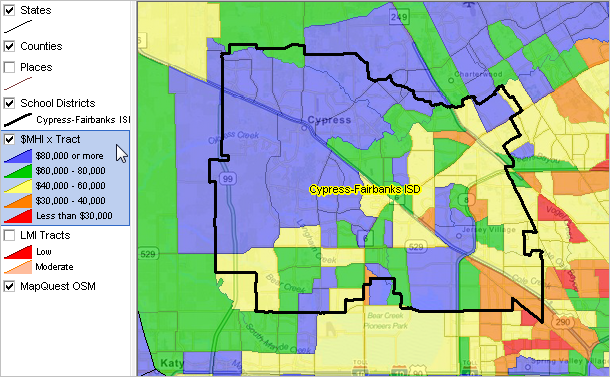 See related Aldine CDP community profile. See related Harris county projections to 2020. .. ACS 2012 5-year median household income for district overall: $41,396. See related Alpine community profile. See related Utah county projections to 2020. .. ACS 2012 5-year median household income for district overall: $76,495. View developed using CV XE GIS and Alaska DMI GIS Project. See related Anchorage Municipality community profile. See related Anchorage Municipality projections to 2020. .. ACS 2012 5-year median household income for district overall: $86,987. View developed using CV XE GIS and Maryland DMI GIS Project. See related Annapolis community profile. See related Anne Arundel county projections to 2020. See related Arlington community profile. See related Tarrant county projections to 2020. .. ACS 2012 5-year median household income for district overall: $50,835. See related Austin community profile. See related Travis county projections to 2020. 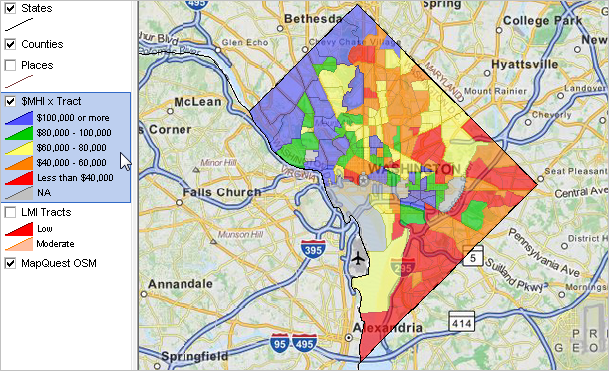 .. ACS 2012 5-year median household income for district overall: $40,803. See related Baltimore community profile. See related Baltimore independent city county projections to 2020. .. ACS 2012 5-year median household income for district overall: $66,068. See related Baltimore county projections to 2020. .. ACS 2012 5-year median household income for district overall: $49,099. 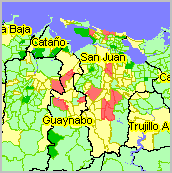 View developed using CV XE GIS and Florida DMI GIS Project. See related Melbourne community profile. See related Brevard county projections to 2020. .. ACS 2012 5-year median household income for district overall: $51,603. See related Fort Lauderdale community profile. See related Broward county projections to 2020. .. ACS 2012 5-year median household income for district overall: $29,677. 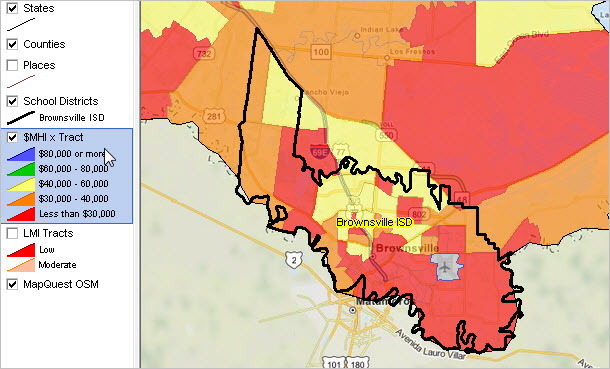 See related Brownsville community profile. 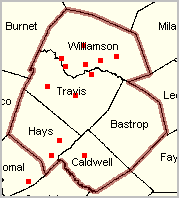 See related Cameron county projections to 2020. .. ACS 2012 5-year median household income for district overall: $97,410. See related San Juan Capistrano community profile. See related Orange county projections to 2020. .. ACS 2012 5-year median household income for district overall: $55,961. View developed using CV XE GIS and North Carolina DMI GIS Project. See related Charlotte community profile. See related Mecklenburg county projections to 2020. .. ACS 2012 5-year median household income for district overall: $70,219. View developed using CV XE GIS and Colorado DMI GIS Project. See related Centennial community profile. See related Arapahoe county projections to 2020. .. ACS 2012 5-year median household income for district overall: $72,363. View developed using CV XE GIS and Virginia DMI GIS Project. See related Richmond community profile. See related Chesterfield county projections to 2020. .. ACS 2012 5-year median household income for district overall: $47,409. View developed using CV XE GIS and Illinois DMI GIS Project. See related Chicago community profile. See related Cook county projections to 2020. .. ACS 2012 5-year median household income for district overall: $54,218. See related Las Vegas community profile. See related Clark county projections to 2020. .. ACS 2012 5-year median household income for district overall: $42,569. See related Morrow community profile. See related Clayton county projections to 2020. .. ACS 2012 5-year median household income for district overall: $62,634. See related Kennesaw community profile. See related Cobb county projections to 2020. .. ACS 2012 5-year median household income for district overall: $36,856. View developed using CV XE GIS and Ohio DMI GIS Project. See related Columbus community profile. See related Delaware county projections to 2020. .. ACS 2012 5-year median household income for district overall: $69,404. 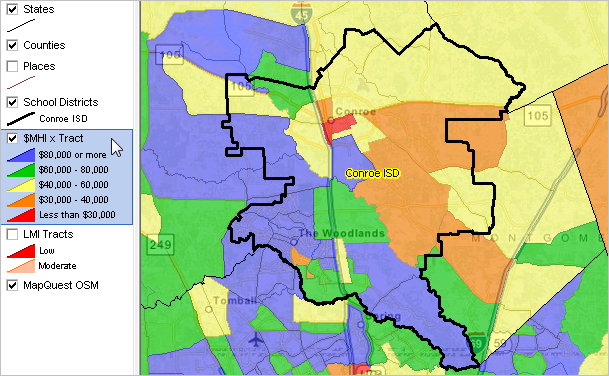 See related Conroe community profile. See related Montgomery county projections to 2020. .. ACS 2012 5-year median household income for district overall: $85,517. See related Corona community profile. See related Riverside county projections to 2020. See related Fayetteville community profile. See related Cumberland county projections to 2020. .. ACS 2012 5-year median household income for district overall: $71,464. See related Houston community profile. .. ACS 2012 5-year median household income for district overall: $41,389. See related Dallas community profile. See related Dallas county projections to 2020. .. ACS 2012 5-year median household income for district overall: $69,355. View developed using CV XE GIS and Utah DMI GIS Project. See related Farmington community profile. See related Davis county projections to 2020. 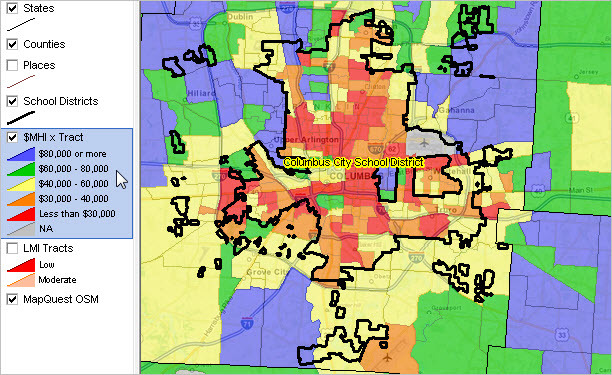 .. ACS 2012 5-year median household income for district overall: $50,520. 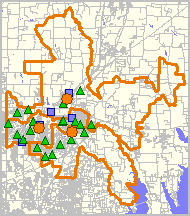 See related Decatur community profile. See related DeKalb county projections to 2020. .. ACS 2012 5-year median household income for district overall: $49,091. See related Denver community profile. See related Denver county projections to 2020. .. ACS 2012 5-year median household income for district overall: $26,956. View developed using CV XE GIS and Michigan DMI GIS Project. See related Detroit community profile. See related Wayne county projections to 2020. .. ACS 2012 5-year median household income for district overall: $64,267. View developed using CV XE GIS and D.C. DMI GIS Project. See related Washington, DC community profile. See related District of Columbia county projections to 2020. .. ACS 2012 5-year median household income for district overall: $101,112. See related Castle Rock community profile. See related Douglas county projections to 2020. .. ACS 2012 5-year median household income for district overall: $48,906. See related Jacksonville community profile. See related Duval county projections to 2020. .. ACS 2012 5-year median household income for district overall: $39,127. 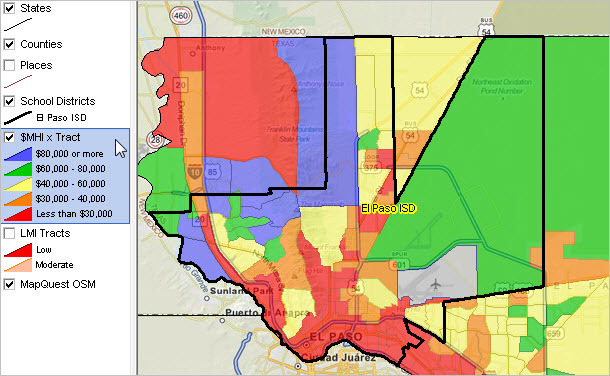 See related El Paso community profile. See related El Paso county projections to 2020. .. ACS 2012 5-year median household income for district overall: $65,979. See related Elk Grove community profile. See related Sacramento county projections to 2020. .. ACS 2012 5-year median household income for district overall: $109,383. See related Fairfax City community profile. See related Fairfax county projections to 2020. .. ACS 2012 5-year median household income for district overall: $45,809. See related Winston-Salem community profile. See related Forsyth county projections to 2020. .. ACS 2012 5-year median household income for district overall: $81,144. See related Sugar Land community profile. 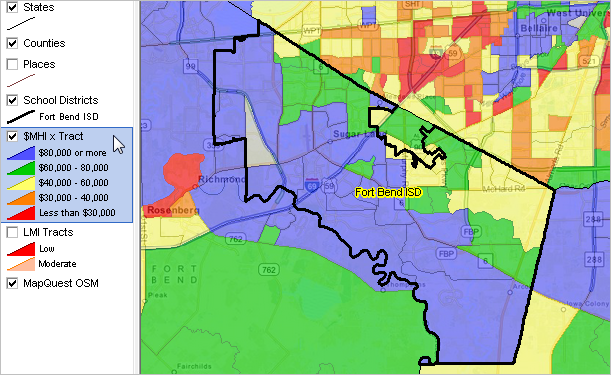 See related Fort Bend county projections to 2020. .. ACS 2012 5-year median household income for district overall: $40,717. See related Fort Worth community profile. See related Denton county projections to 2020. .. ACS 2012 5-year median household income for district overall: $35,957. See related Fresno community profile. See related Fresno county projections to 2020. .. ACS 2012 5-year median household income for district overall: $68,238. See related Roswell community profile. .. ACS 2012 5-year median household income for district overall: $59,958. See related Garden Grove community profile. .. ACS 2012 5-year median household income for district overall: $58,485. 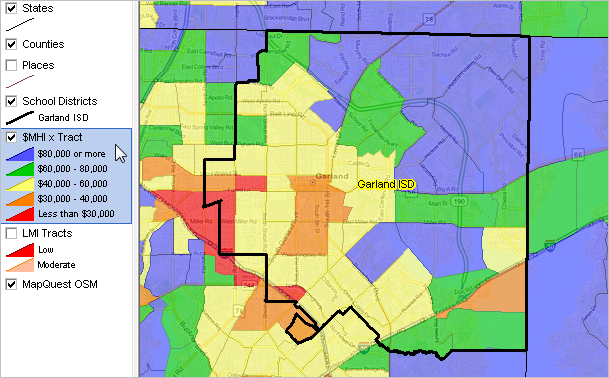 See related Garland community profile. See related Collin county projections to 2020. .. ACS 2012 5-year median household income for district overall: $54,241. See related West Valley community profile. 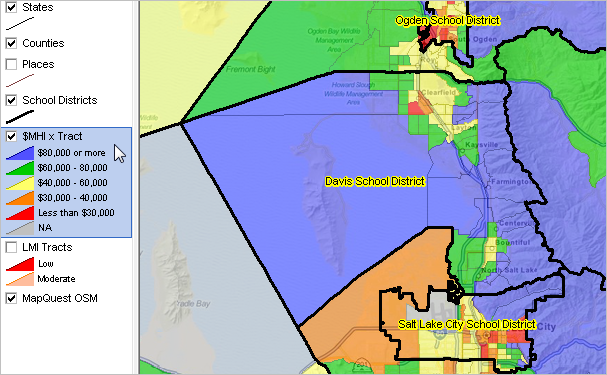 See related Salt Lake county projections to 2020. .. ACS 2012 5-year median household income for district overall: $47,987. View developed using CV XE GIS and South Carolina DMI GIS Project. See related Greenville community profile. 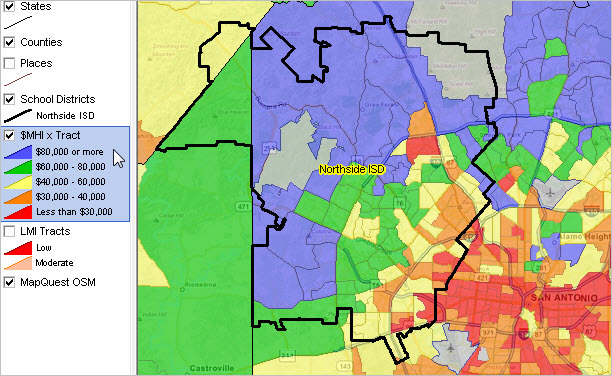 See related Greenville county projections to 2020. .. ACS 2012 5-year median household income for district overall: $46,223. See related Greensboro community profile. See related Guilford county projections to 2020. See related Lawrenceville community profile. .. ACS 2012 5-year median household income for district overall: $67,492. 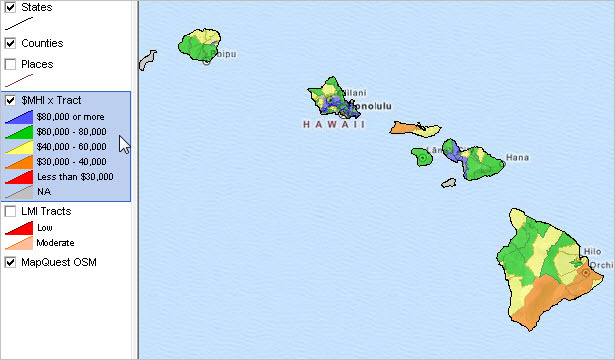 View developed using CV XE GIS and Hawaii DMI GIS Project. See related Hilo CDP community profile. 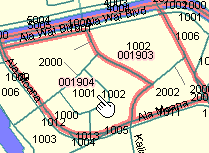 See related Hawaii county projections to 2020. .. ACS 2012 5-year median household income for district overall: $61,300. See related Henrico county projections to 2020. .. ACS 2012 5-year median household income for district overall: $49,450. See related Tampa community profile. See related Hillsborough county projections to 2020. .. ACS 2012 5-year median household income for district overall: $45,222. .. ACS 2012 5-year median household income for district overall: $107,821. See related Columbia community profile. See related Howard county projections to 2020. .. ACS 2012 5-year median household income for district overall: $68,741. See related Golden community profile. 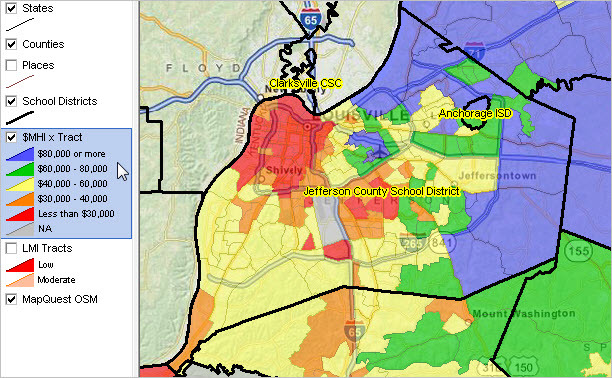 See related Jefferson county projections to 2020. .. ACS 2012 5-year median household income for district overall: $46,591. View developed using CV XE GIS and Kentucky DMI GIS Project. 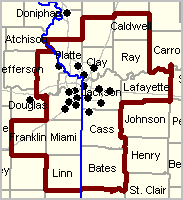 See related Louisville community profile. .. ACS 2012 5-year median household income for district overall: $48,522. View developed using CV XE GIS and Louisiana DMI GIS Project. See related New Orleans community profile. 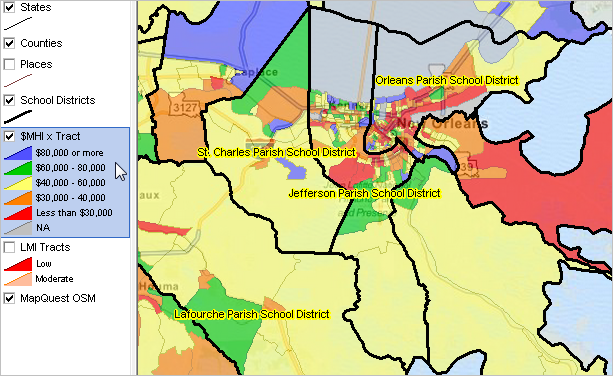 See related Jefferson Parish projections to 2020. .. ACS 2012 5-year median household income for district overall: $75,579. 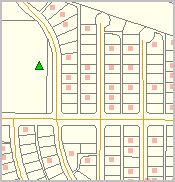 See related West Jordan community profile. See related Salt Lake County county projections to 2020. .. ACS 2012 5-year median household income for district overall: $87,829. See related Katy community profile. See related Spring CDP community profile. .. ACS 2012 5-year median household income for district overall: $47,270. View developed using CV XE GIS and Tennessee DMI GIS Project. See related Knoxville community profile. See related Knox county projections to 2020. .. ACS 2012 5-year median household income for district overall: $48,453. See related Fort Myers community profile. See related Lee county projections to 2020. .. ACS 2012 5-year median household income for district overall: $81,912. 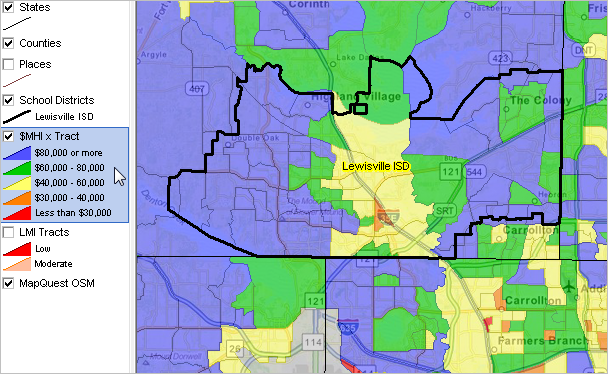 See related Lewisville community profile. .. ACS 2012 5-year median household income for district overall: $55,287. See related Long Beach community profile. See related Los Angeles county projections to 2020. .. ACS 2012 5-year median household income for district overall: $49,322. See related Los Angeles community profile. .. ACS 2012 5-year median household income for district overall: $122,068. 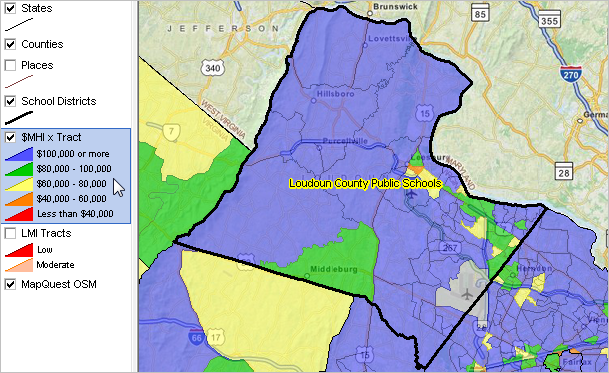 See related Loudoun county projections to 2020. .. ACS 2012 5-year median household income for district overall: $32,228. See related Memphis community profile. See related Shelby county projections to 2020. .. ACS 2012 5-year median household income for district overall: $46,272. View developed using CV XE GIS and Arizona DMI GIS Project. See related Mesa community profile. See related Maricopa county projections to 2020. .. ACS 2012 5-year median household income for district overall: $43,464. See related Miami community profile. See related Miami-Dade county projections to 2020. .. ACS 2012 5-year median household income for district overall: $35,837. View developed using CV XE GIS and Wisconsin DMI GIS Project. See related Milwaukee community profile. See related Milwaukee county projections to 2020. .. ACS 2012 5-year median household income for district overall: $42,740. View developed using CV XE GIS and Alabama DMI GIS Project. See related Mobile community profile. See related Mobile county projections to 2020. 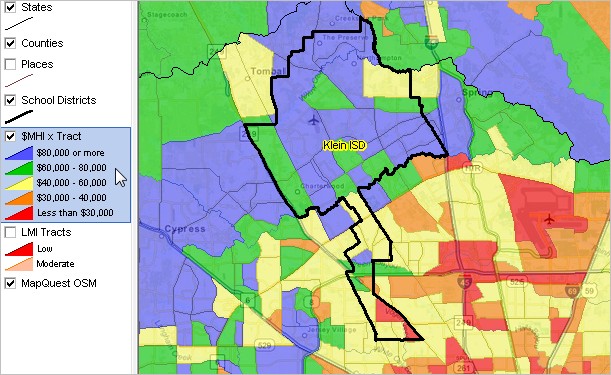 .. ACS 2012 5-year median household income for district overall: $96,985. See related Rockville community profile. .. ACS 2012 5-year median household income for district overall: $46,676. See related Nashville community profile. See related Davidson county projections to 2020. .. ACS 2012 5-year median household income for district overall: $51,865. 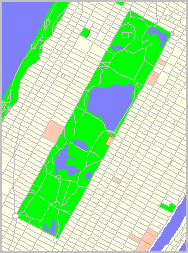 View developed using CV XE GIS and New York DMI GIS Project. See related New York community profile. See related New York county projections to 2020. .. ACS 2012 5-year median household income for district overall: $57,233. 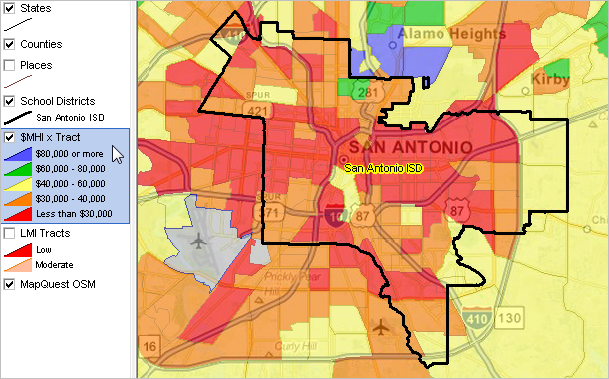 See related San Antonio community profile. See related Bexar county projections to 2020. .. ACS 2012 5-year median household income for district overall: $57,455. .. ACS 2012 5-year median household income for district overall: $51,661. See related Oakland community profile. See related Alameda county projections to 2020. .. ACS 2012 5-year median household income for district overall: $44,947. View developed using CV XE GIS and Nebraska DMI GIS Project. See related Omaha community profile. .. ACS 2012 5-year median household income for district overall: $48,429. See related Orlando community profile. .. ACS 2012 5-year median household income for district overall: $44,887. See related Kissimmee community profile. See related Osceola county projections to 2020. .. ACS 2012 5-year median household income for district overall: $52,806. See related Palm Beach community profile. See related Palm Beach county projections to 2020. .. ACS 2012 5-year median household income for district overall: $43,787. See related Land O Lakes community profile. See related Pasco county projections to 2020. .. ACS 2012 5-year median household income for district overall: $37,016. View developed using CV XE GIS and Pennsylvania DMI GIS Project. See related Philadelphia community profile. See related Philadelphia county projections to 2020. .. ACS 2012 5-year median household income for district overall: $46,051. .. ACS 2012 5-year median household income for district overall: $80,276. See related Winter Haven community profile. See related Polk county projections to 2020. .. ACS 2012 5-year median household income for district overall: $43,606. 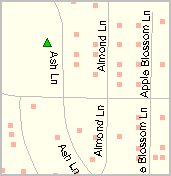 See related Plano community profile. .. ACS 2012 5-year median household income for district overall: $73,568. See related Greenbelt community profile. See related Prince Georges county projections to 2020. See related Prince William county projections to 2020. 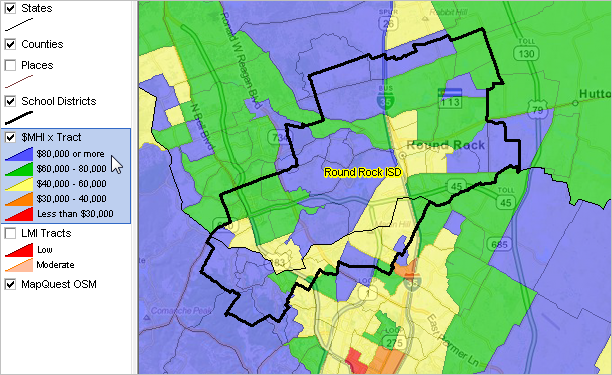 See related Round Rock community profile. .. ACS 2012 5-year median household income for district overall: $48,301. See related Sacramento community profile. .. ACS 2012 5-year median household income for district overall: $30,577. .. ACS 2012 5-year median household income for district overall: $39,551. See related San Bernardino community profile. See related San Bernardino county projections to 2020. .. ACS 2012 5-year median household income for district overall: $59,835. See related San Diego community profile. See related San Diego county projections to 2020. .. ACS 2012 5-year median household income for district overall: $73,802. See related San Francisco community profile. See related San Francisco county projections to 2020. .. ACS 2012 5-year median household income for district overall: $55,801. See related Santa Ana community profile. .. ACS 2012 5-year median household income for district overall: $58,577. See related Seminole community profile. See related Sanford community profile. See related Seminole county projections to 2020. .. ACS 2012 5-year median household income for district overall: $77,389. See related Germantown community profile. .. ACS 2012 5-year median household income for district overall: $40,767. See related Tucson community profile. See related Pima county projections to 2020. .. ACS 2012 5-year median household income for district overall: $65,980. See related Virginia Beach community profile. See related Virginia Beach county projections to 2020. .. ACS 2012 5-year median household income for district overall: $43,419. See related Daytona Beach community profile. See related Volusia county projections to 2020. .. ACS 2012 5-year median household income for district overall: $65,826. See related Cary community profile. See related Wake county projections to 2020. .. ACS 2012 5-year median household income for district overall: $53,994. View developed using CV XE GIS and Nevada DMI GIS Project. See related Reno community profile. 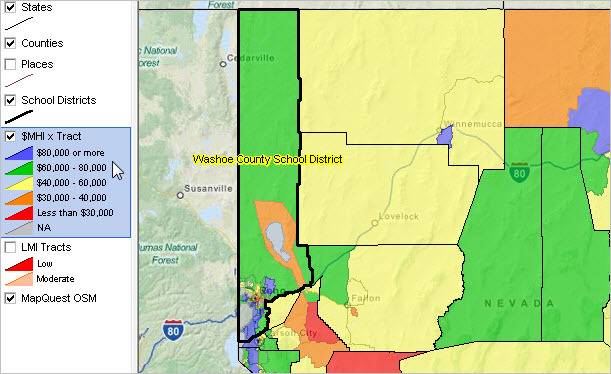 See related Washoe county projections to 2020. .. ACS 2012 5-year median household income for district overall: $43,171. View developed using CV XE GIS and Kansas DMI GIS Project. See related Wichita community profile. See related Sedgwick county projections to 2020.